the chair of ‘individualized production’ (IP) founded and headed by professor sigrid brell-cokcan at the RWTH aachen university, has developed a new methodology for the on-site construction of non-standard components using mobile robots. IP is an inter-disciplinary chair consisting of architects, designers, computer scientists, mechanical engineers and robotic experts who focus on advancing construction technology. 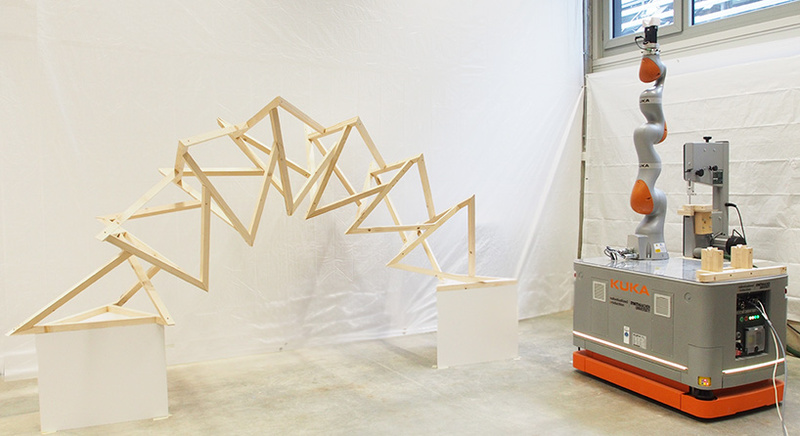 pradeep devadass, an architect and sven stumm, a computer scientist, working at IP have demonstrated the methodology through the project ‘the twisted arch’, which comprises of complex space frame timber system. 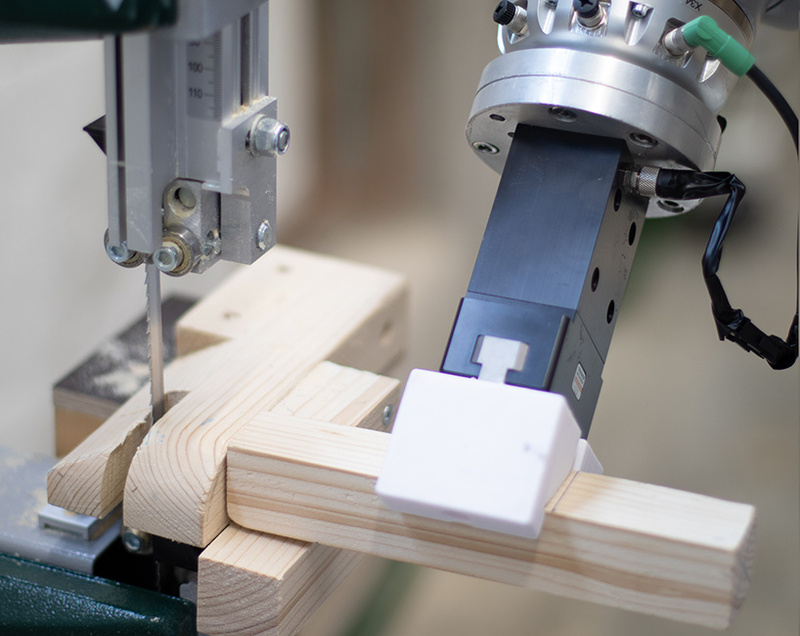 for fabrication, the robot holds and pushes the timber piece through the band saw at specific angles. there are certain angles which the robot might not be able to access due to its reachability constraints. to resolve this, the mobile platform is moved to an optimum position to reconfigure the pose of the robot. the construction floor is never perfect which might result in errors due to the continuous movement of the robot. 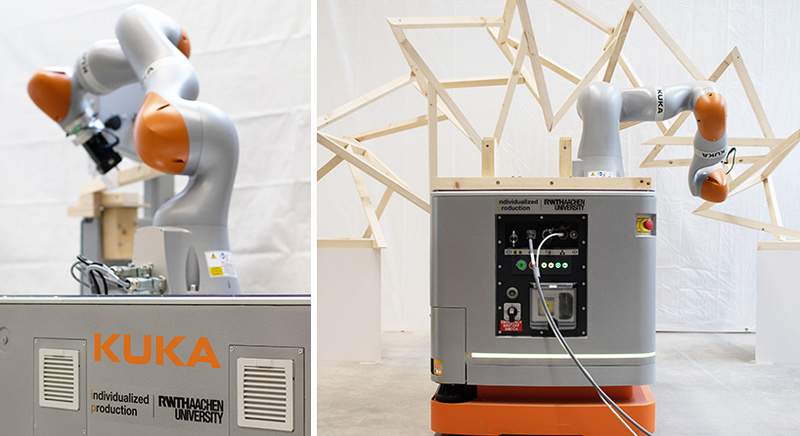 to resolve this problem, the chair has developed a state-of-the-art haptic feedback method which utilizes force torque sensors embedded in the KUKA IIWA for calculating the deviations in the target position. the dynamic process is suitable for improving the accuracy of the robotic production, especially in the continuously changing construction environments. the assembly process is conducted through human-robot collaboration in two steps. 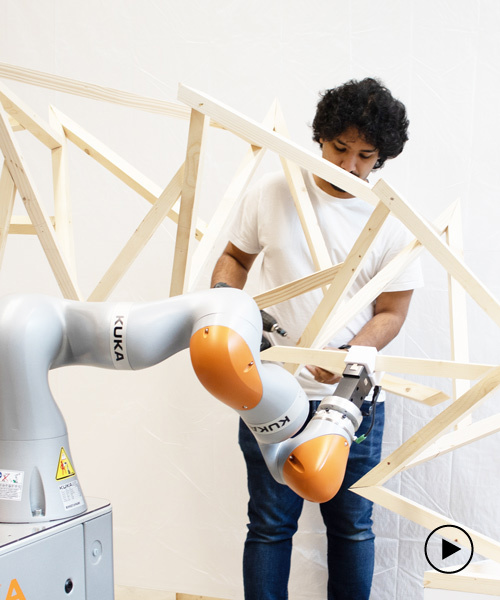 first, the robot moves to the assembly area and assists the user by placing the timber at its correct position and orientation. next, the user manually fixes the component to the structure. at instances where errors are encountered due to onsite conditions, the user manually adjusts the robot position through soft mode. this position can be automatically updated into the digital design for further use. the entire process from design to construction is automated through the use of custom algorithms and programming interfaces developed by the chair. 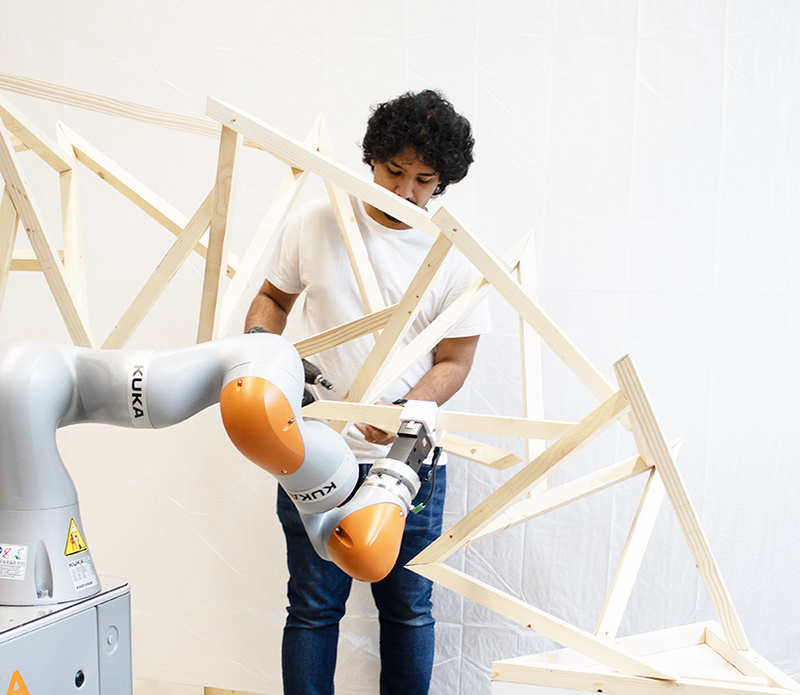 the chair envisions to bring mobile robots to construction sites for complex processes.